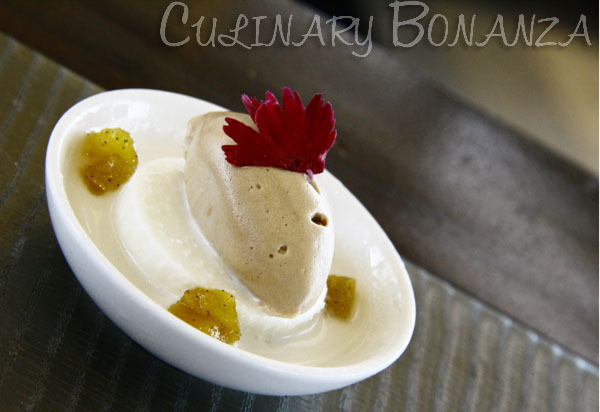 Lately, there is a growing trend of combining sweet and savoury tastes in one dish. A perfect example of this is the "Sea Salt-Caramel" trend. Have you noticed the latest Magnum Gold campaign or the latest Starbucks Coffee's flavour for this season, Sea Salt Caramel Mocha? 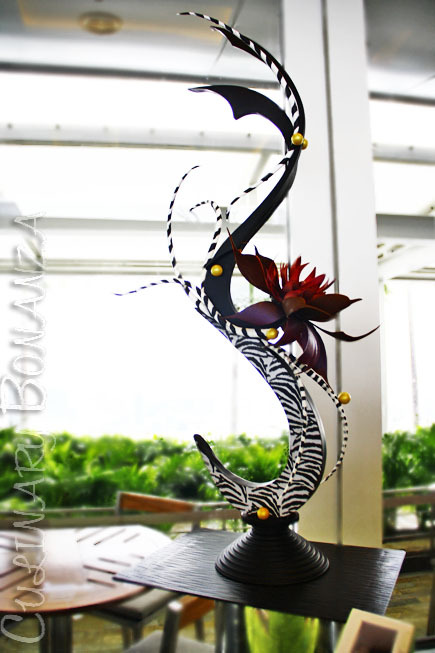 This is nothing novel apparently, at least not to Ryan Witcher, the Executive Pastry Chef of Marina Bay Sands. Born 30 years ago and raised around farms and farmers' markets in Michigan, United States, Chef Ryan naturally has a strong affinity for using only the freshest, straight-off-the-tree produce and ingredients in his creations. Long before the sweet and savoury fusion became a trend, Chef Ryan had made it his signature style. 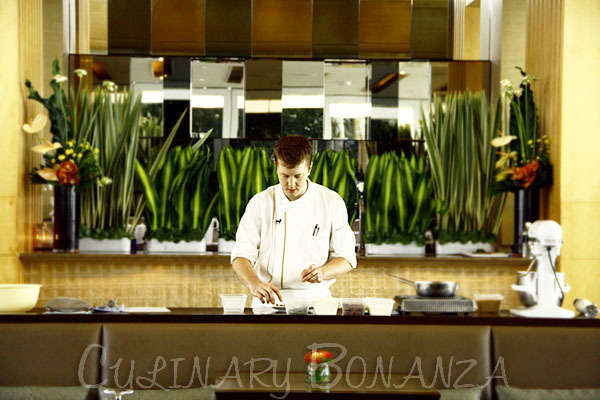 In May 2012, Ryan Witcher joined Marina Bay Sands as the Executive Pastry Chef who oversees the daily operations of the bakery and dessert kitchens that bake breads, rolls and buns in the masses, 7 days a week to be distributed to the restaurants at the property. Besides that, Chef Ryan also manages the Sweet Spot, the hotel's espresso bar, bakery & dessert concept, where guests can find delightful fine pralines, macarons, and other sweet stuff for quick sugary fix. Some quirky praline flavours are such as bacon, milk-chocolate thyme, strawberry balsamic and rhubarb. 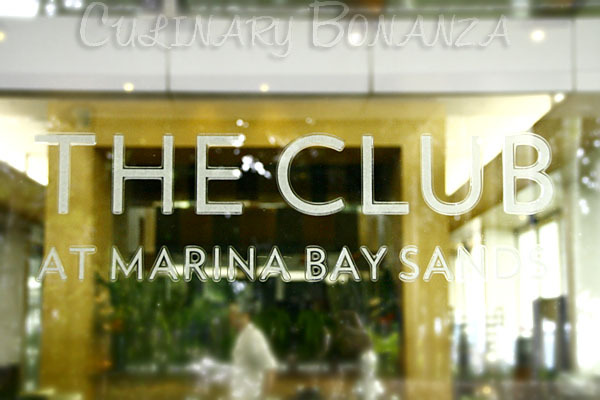 The live cooking demo took place at The Club, which on normal days serve as an exclusive all-day dining venue only for guests staying in the the Club Rooms and Suites of Marina Bay Sands. Exclusivity is always good. The limited access allows for more relaxed breakfast without having to jostle with other hotel guests or to endure the din like what the experience at Rise Restaurant. The Club is divided into indoor and outdoor alfresco sections. Being 57 floors above ground means the majestic vista overlooking the infinity pool and the Marina Bay will keep guests company while they savour the scrumptious meal at The Club. An hour with Ryan Witcher means 60 minutes of pure sugar rush and I'm loving every second of it! The demo began with Chef Ryan making milk-chocolate rosemary whipped ganache. The ingredients used are fresh rosemary, heavy whipping cream, glucose syrup, inverted sugar, milk chocolate, heavy whipping cream and salt. Making the perfect melt-in-your-mouth ganache is an overnight process. Being known for his fastidiousness, Chef Ryan would always take a sample of his cooking at each step. This way, he could easily eliminate any missteps or unsuitable ingredients and ensure that what's brewing is always on the right track. We were then let to sample the unset molten ganache. The rosemary scent actually reminded me of creamy & savoury pasta sauce. But upon savouring, I was quite surprised that it tasted pleasant even though it's sweet. The set ganache will be used to make Rosemary Infused Milk-Chocolate with Coconut Agar. The single serving dessert tasted lovely, especially with the caramelized pineapple that gave a fresh twist to the creamy treat. 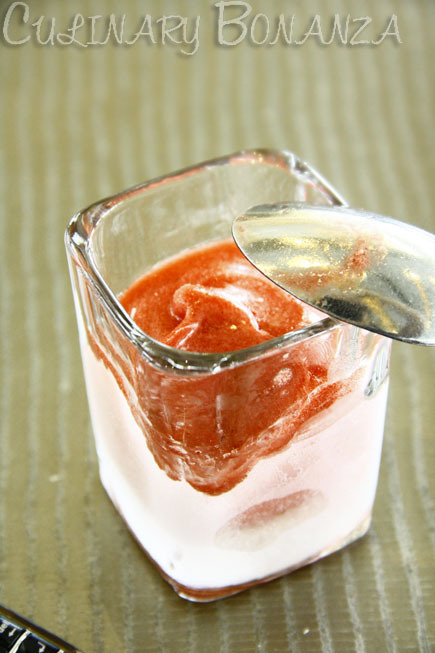 Next up was preparing strawberry-basil sorbet using fresh strawberry puree, water, sugar, powdered glucose, basil leaves and salt. It was my first time trying a strawberry and basil combination, which is at the same time Chef Ryan's all-time favourite combination. From the knowledge I had gathered previously, basil is most appropriate to go with tomato-based pasta sauce. Now it is evident that besides tomato, basil goes well with basically anything fresh and that has sour tartness in it, such as strawberry. The last and most awaited moment is the chocolate preparation. Chef Ryan was going to make thyme-infused milk chocolate, one of the unique-flavours of pralines that can be found at Sweet Spot. I used thyme to cook my favourite cream of mushroom soup, so the praline automatically triggered the image of mushroom soup in my mind. But the tongue cannot lie. As the chocolate melted in my mouth, all the previous stereotype and skepticism I had about herbs infused sweets were shattered for good. 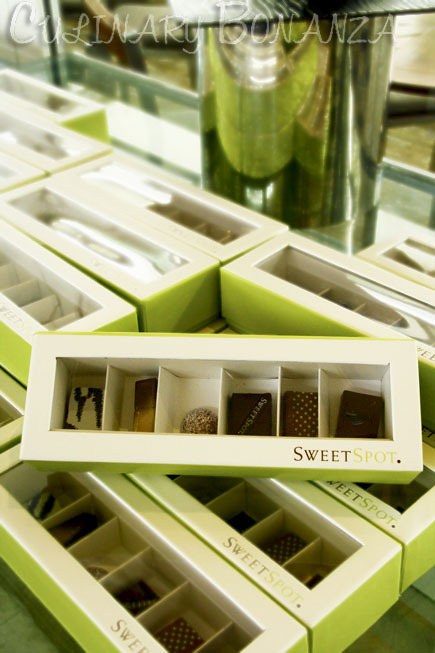 At the end of the session, we were each given a box of gourmet pralines from Sweet Spot. Thanks to Chef Ryan for the nectarous session!